A 29-year-old man presented with a three-week history of slurred speech, poor coordination, and imbalance while walking. He did not have a family history of neurodegenerative disorders or autoimmune conditions. On physical exam, he was alert and oriented to person, place, time, and situation. He displayed dysarthric speech and ataxic gait, and he scored 4/5 in upper and lower extremity strength testing. Cerebrospinal fluid studies revealed normal protein, cell count, and glucose levels. Syphilis, HIV, West Nile, HSV, JC virus, CMV, and arbovirus serologies returned negative. Likewise, the patient tested negative for ANA and rheumatoid factor antibodies. Urine toxicology was positive for opiates. Upon further questioning, the patient admitted to smoking heroin vapor. Over six days of hospitalization, his physical exam findings were stable, and the patient was discharged to a rehabilitation facility. On MRI, FLAIR sequence showed bilateral and symmetrical hyperintensities in the posterior limb of the internal capsule, occipital lobe white matter, and splenium of the corpus callosum (Figure 1). Additional symmetrical FLAIR hyperintensities involved the cerebellar white matter extending to the middle cerebellar peduncles (Figure 2). On T1 sequences, these lesions were hypointense and did not enhance following contrast administration. On diffusion weighted imaging (DWI), the lesions displayed increased signal (Figure 3), and corresponding apparent diffusion coefficient (ADC) sequence findings were consistent with diffusion restriction. Ataxia and dysarthria are common presenting signs; however three clinical stages of the disease have been described. The initial stage is characterized by cerebellar ataxia, soft speech, and motor restlessness.4 Patients may remain within the first stage or progress onto the second and third stages. Approximately half of patients develop an intermediate form of illness and exhibit worsening cerebellar signs, hyperactive reflexes, spastic paraparesis, myoclonus, and chorea.4 One-quarter of patients enter the third stage of illness marked by akinetic mutism, hypotonic areflexic paresis, central pyrexia, and eventual death.4 The natural history of HASL is variable, with survivors exhibiting mild to marked improvement. Clinical management for HASL is based on supportive care. In case reports, treatment with coenzyme Q has been associated with reversal of clinical and radiological findings.9 Enhanced cognition has been observed after treatment with methylphenidate.10 To date, however, no randomized clinical trials have tested the efficacy of these interventions. The inhalation of impurities in heroin vapor is responsible for a vacuolating myelinopathy termed heroin-associated spongiform leukoencephalopathy. 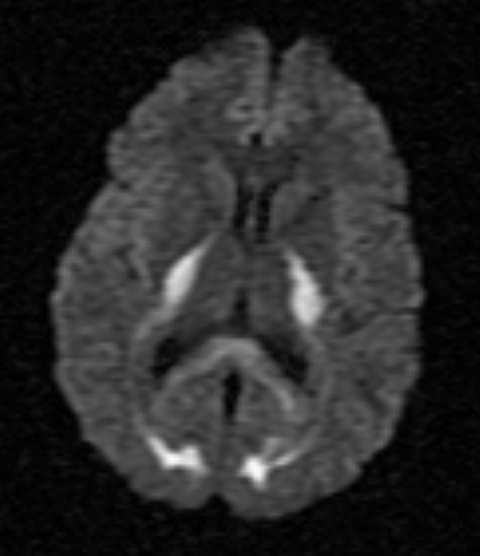 Findings on MRI T2-weighted sequences are nearly pathognomonic and are characterized by bilateral and symmetrical white matter hyperintensities with a predilection for the occipital and parietal lobes, splenium of the corpus callosum, and posterior limb of the internal capsule with sparing of the anterior limb. Infratentorial involvement is characterized by T2 hyperintensity in the cerebellar white matter and peduncles. Three distinct stages of illness are recognized, with ataxia and dysarthria being common initial presenting signs. The clinical course is variable, and no definitive treatment has been identified. Wolters EC, Stam FC, Lousberg RJ, et al. 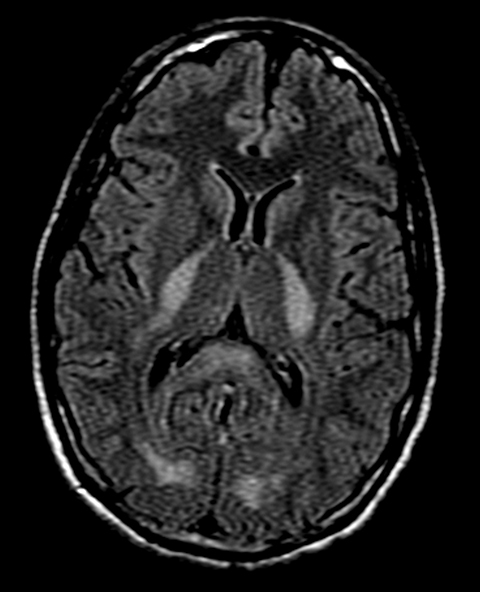 Leucoencephalopathy after inhaling “heroin” pyrolysate. The Lancet. 1982;320:1233-1237. Keogh CF, Andrews GT, Spacey SD, et al. Neuroimaging features of heroin inhalation toxicity: “chasing the dragon.” American Journal of Roentgenology. 2003;180:847-850. Tan TP, Algra PR, Valk J, Wolters EC. Toxic leukoencephalopathy after inhalation of poisoned heroin: MR findings. American Journal of Neuroradiology. 1994;15:175-178. Kass-Hout T, Kass-Hout O, Darkhabani MZ, et al. “Chasing the Dragon” Heroin-Associated Spongiform Leukoencephalopathy. Journal of Medical Toxicology. 2011;7:240-242. Chang WC, Lo CP, Kao HW, Chen CY. 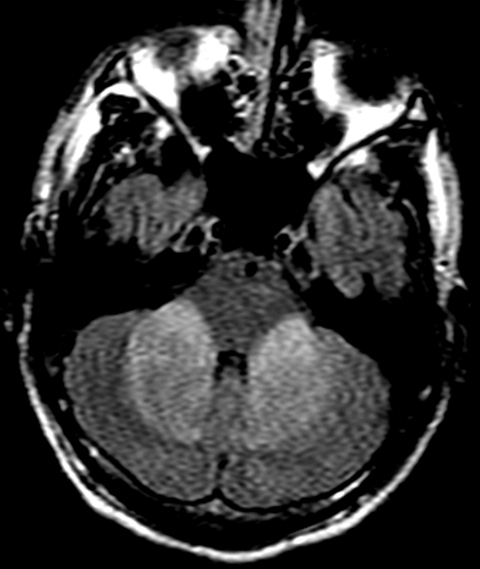 MRI features of spongiform leukoencephalopathy following heroin inhalation. Neurology. 2006;67:504-504. Bega DS, McDaniel LM, Jhaveri MD, Lee VH. Diffusion weighted imaging in heroin-associated spongiform leukoencephalopathy. Neurocritical Care. 2009;10:352-354. Offiah C, Hall E. Heroin-induced leukoencephalopathy: characterization using MRI, diffusion-weighted imaging, and MR spectroscopy. Clinical Radiology. 2008;63:146-152. Bartlett E, Mikulis DJ. Chasing “chasing the dragon” with MRI: leukoencephalopathy in drug abuse. The British Journal of Radiology. 2005;78:997-1004. Gacouin A, Lavoue S, Signouret T, et al. Reversible spongiform leucoencephalopathy after inhalation of heated heroin. Intensive Care Medicine. 2003;29:1012-1015. 10. Rao M, Wilson Z. Chasing the dragon. Current Psychiatry. 2010;9:77. Liu S, Tanoura T. Heroin-associated spongiform leukoencephalopathy. Appl Radiol. 2016;45(11):50-52. Prepared by Dr. Liu while a Radiology Resident and Dr. Tanoura while a Neuroradiologist at Harbor-UCLA Medical Center, Torrance, CA.